$25.00 In stock. Order in the next 3 hours, 30 minutes and it will go out today! 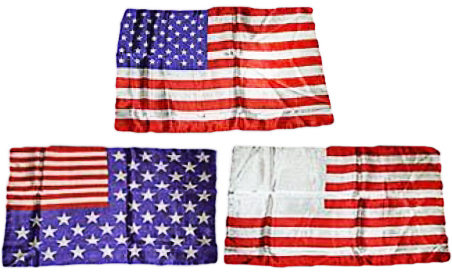 Mismade Flag is a classic, wonderful routine for American audiences and this is the finest version we've come across. Why? Because this version has an additional twist -- a phase where your audience sees a flag where the stars and stripes are all mixed up. This gives you additional possibilities for comedy and lots of cheers (and jeers) from your kid audience. 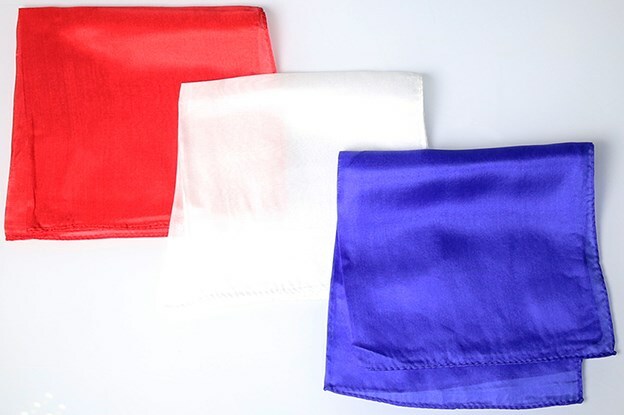 You begin by putting three handkerchiefs -- red, white and blue into an empty bag. But, "oops," you drop the blue on one the floor. When the colors magically combine, your claim to make a flag appear goes sideways -- it's just red and white striped. No blue! And no stars! You discover your "mistake," add the blue back in with the red and white mismade flag, but this time you forget to say the magic word. The mismade result? You pull out a silk where the stars and striped are reversed! The kids go wild with laughter and frustration as your magic "isn't working." On your last attempt, you put the mixed up flag back into the bag; everyone chants the magic word; you add a little wand waving and the proper flag appears -- and you get a big patriotic round of applause. The flag silks are nicely sized at 14 x 21". The smaller silks are 12" squares. You add your own change bag or switching device and you'll have a routine that's perfect for American audiences for shows during Memorial Day, July 4th, Labor Day or Presidents' Day and any school or library show themed with US history.